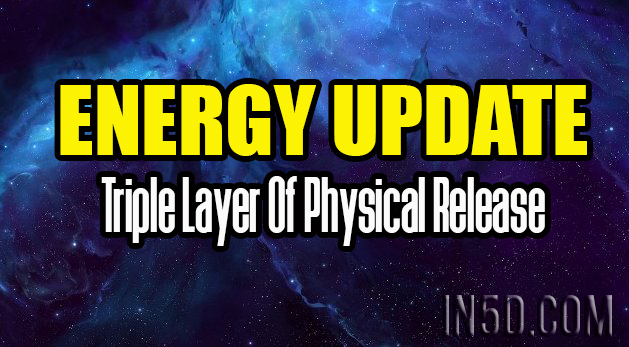 THIS IS THE FIRST TIME WE HAVE EXPERIENCED: A TRIPLE LAYER OF PHYSICAL RELEASE/HEALING! A TRIPLE LAYER OF PHYSICAL ‘AILMENTS’ AND SYMPTOMS OF WHAT WE EACH INDIVIDUALLY (YET COLLECTIVELY) – NEEDED TO RELEASE – THAT WAS ‘BURIED/HIDDEN CORE/DNA/CELLULAR DEEP! I ‘knew’ this was BIG in what I was going through with the Influenza A symptoms (refer Pt 2) re-flaring for a DNA/cellular release, yet, I also knew on ANOTHER LEVEL that this was more than ‘just this’…as if that was not enough to experience lol. Upon this layer, came another layer of symptoms of severe Sinusitis/Hay fever/Allergies and also like a middle ear infection! ‘Thank God’ (literally) that I have learnt over the years how to ‘treat’ this naturally as I was taking so much of many things. My whole day (over the last 4 days/nights) was constantly just taking this and then that. This morning, I have now ‘turned the corner’ with all of this and this came with messages and insight of what I am sharing here with you now. When I felt what the bigger picture is, that this was ‘Triple layered’ – I could not physically talk! It was such an overwhelming validation of how I was feeling physically, that it was not ‘just’ one ‘ailment’ symptom I was feeling and experiencing – but a TRIPLE LAYER. Of feeling a TRIPLE LAYER of physical symptoms, from the recent TRIPLE ENERGIES that came through, as shared in Pt 2. It was such a RELIEF when this shifted through, that I shed tears of relief. And now I feel I can breathe and the ‘symptoms’ are all now slowly subsiding, again phew, what a relief. HAD AN OPPORTUNITY OR CHOICE TO PASS OVER RECENTLY!! For me, in what I have shared, this is what I needed to feel and experience and endure to release within myself. After facing near death/dying over 15 ways/times – in various ways over the years. Of ‘healing’ so much already, so I can be here with you all, bringing through and sharing my experiences and guidance of the Divine as a Template in linking our Spirit to our Soul in 6D Human Embodiment. I know many other souls who have been dealing with health ‘issues’ in other areas, are also finding this ‘very tough’. I want to say to those souls, that you are so very BRAVE and STRONG in what you are feeling and experiencing! That many of you had a ‘choice’ to make recently in ‘staying or going’. May this Divine Healing coming through in reading and feeling this sharing – allow you to realise that YOU CHOSE TO STAY to assist with not only YOUR ASCENSION but also HUMANITIES as well. With validation that you have been feeling TRIPLE physically and this is why. As this needed to be pushed through us that CHOSE to be the Brave Spiritual Warriors that we are – for the GREATER OF ALL OF HUMANITIES ASCENSION as well as OUR/YOUR ASCENSION. Otherwise, I too would not have ‘been here’ 😉. I can see and feel this coming through now with more insights for and with humanity, that I will share soon, as guided! This is very exciting! This is for the ‘greater good of all’ and I honour each one of you in all you are in experiencing what you have in your life up to now. I will share with you one last thing. While I have been feeling triple physical ailments I also did 3 Divine healings this week. These are very huge that go for a minimum of 2 hrs, usually 3. Yet yesterday I reached a point, as I had one more to do of – NO MORE, CUT OFF POINT – and I saw a ‘dead end’ or a ‘wall’ in front of me. From time to time over the years I have seen this, when it is a very major ‘turning point’ for us. And we have 8th of August to experience yet ;-). All of this is part of and leading into the 888 energies. We have reached a ‘dead end’ or a ‘wall’ of the old in letting go of so much and to do with others as well. As we have each needed to do this, by ‘ourselves’ – in our own energy ‘spaces’. We have not been able to be in others’ spaces…we very much needed to be in our own spaces during this time of transition and the largest Metamorphosis of mankind – as this is a FIRST for us ALL. I assure you, this has not been a ‘small thing’ we have/are enduring/going through or have ever experienced before! You, me, WE…the Ground Crew here and now, who have so bravely chosen to endure and experience all we are. We are the f***ing change!!! Please breathe this energy in as you read and feel this latest sharing of our/humanities Ascension…as this WILL BE WORTH IT…please have faith in TRUST in the DIVINE and WITHIN YOURSELF.